Oroeco is an award-winning web and mobile social game and technology platform that makes it fun, easy, and rewarding for everyone to take action on climate every day, while encouraging their friends, family, and global community members to join in collective solutions. Oroeco is a web and mobile tech platform that makes it fun, easy, and rewarding to take action on climate change. 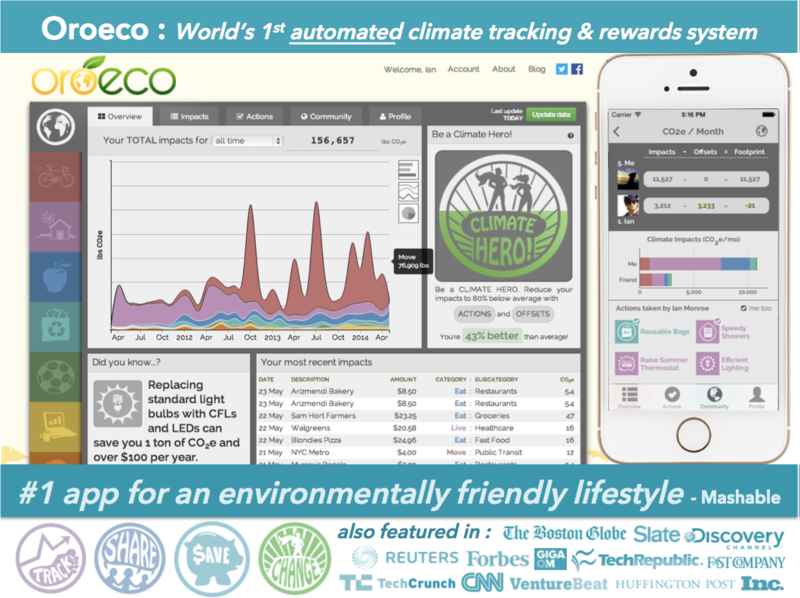 Oroeco empowers and rewards over 50 climate-friendly behaviors in all aspects of a person’s daily life, from transportation and home energy, to diet, shopping, entertainment, and investing. Population impacted: Oroeco has also led to the foundation of Etho Capital, which is empowering hundreds of thousands of people in the US, Canada, and Australia to make more money through climate-friendly investments, and carbon offsets from Oroeco users support clean cookstove expansion in East Africa. Apologies that our responses will be brief, as we were only made aware of this contest a few hours before the deadline. Please see www.oroeco.com for more info, and Google news “Oroeco” for some of our global media coverage. Oroeco is a free web and mobile technology platform that users around the world engage with to earn rewards for climate-friendly behaviors while comparing, competing, and collaborating with their communities through social media. From diet and home energy, to transportation, shopping, and investments, Oroeco is rewarding improvements in every aspect of an individual’s personal carbon footprint, while empowering users to encourage their friends, family, and larger communities to do the same. We started by automatically verifying behavior through financial transaction data from credit cards and bank accounts via Mint.com, as well as Green Button energy data. To date, Oroeco users have reduced over 90 million kg of CO2e while simultaneously saving over $20 million USD and earning virtual currency, points, prizes, and other rewards. Oroeco combines behavioral psychology with climate science and social gaming technology to make climate behavior change easy, fun, and rewarding. We’ve been going as a labor of love for years, and we’ve earned many awards and international media features along the way. Check out oroeco.com for more details. 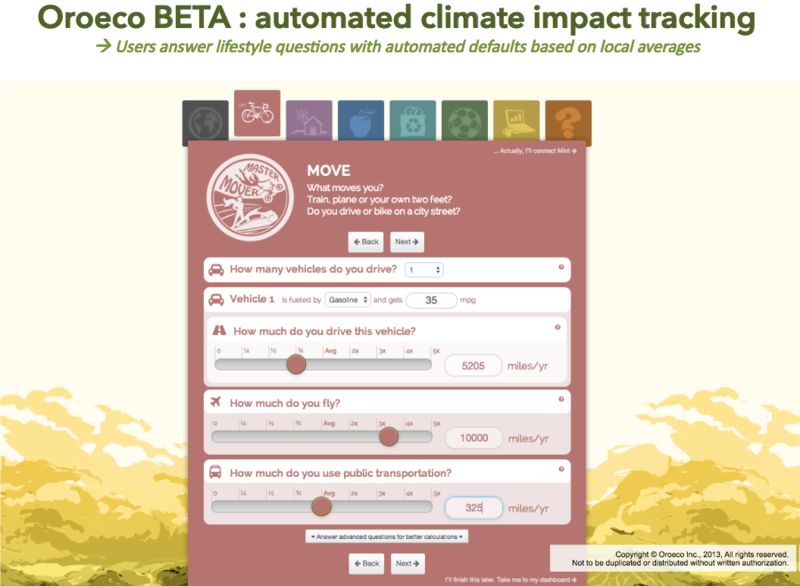 Oroeco provides personalized climate actions for our users in over 170 countries related to all the major categories of personal climate footprint (diet, transportation, home energy, shopping, etc). We ensure user behavior through financial transaction and energy data, as well as self-reporting and social network engagement. Our enabling conditions are the social networks, data and smartphone technologies that power our platform, as well as the climate and behavior science the inform our calculations and UI/UX. Our key success factors are user growth, GHG reductions, money savings, and user engagement to encourage virtuous cycles of community climate action. Our key challenges are user engagement and growth, similar to any other social technology platform; we’re currently designing and raising funding for an Oroeco 3.0 version that we expect will substantially improve climate action engagement and organic viral growth. We’ve engaged with many key partners to bring Oroeco to life, including the UC Berkeley Cool Climate Network, Low Carbon City, Elemental Excelerator, Start-Up Chile, US Department of Energy, Trucost, Echoing Green, Impact Carbon, and Etho Capital. 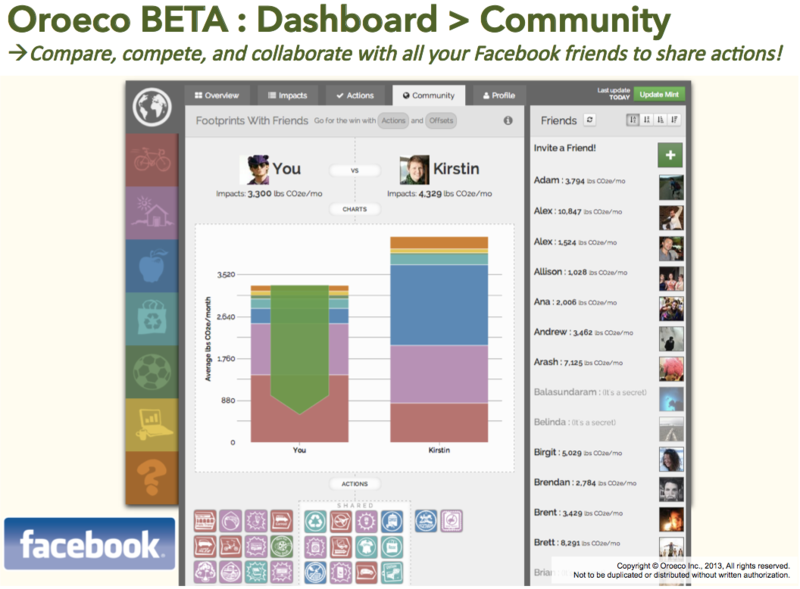 We’ve had over 100,000 users in over 170 countries with a wide range of demographic profiles. While we give users a wide range of potential climate actions (>50), among the top climate behavior changes that users report are recycling, reusing bags, turning off lights when leaving the room, eating less red meat, reducing food waste, washing laundry in cold water, bringing reusable dishes, installing efficient lighting, composting, shopping less, buying vintage, biking, public transportation, hang drying laundry, taking shorter showers, flying less / stay-cations, and adjusting thermostats. Based on our user climate action data, Oroeco users have reduced over 90 million kg of CO2e while simultaneously saving over $20 million USD and earning virtual currency, points, prizes, and other rewards. Co-benefits include climate literacy about which personal solutions are more important, health improvements from better diet and exercise, financial savings, social status, virtual prizes and rewards, real-world prizes, improvements in water, food, biodiversity, and other pollution reductions that come from more efficient consumption, as well as health, education, security, biodiversity, and sustainable development projects from clean cookstove projects. Oroeco has been funded through a mix of grants and private investment, as well as a share of revenue from carbon offset sales. Oroeco plans to scale through revenue from climate solution marketing and revenue from Etho Capital’s climate-friendly investments (which Oroeco co-founded); Etho Capital’s ETHO and ETHI ETF funds created in collaboration with Oroeco are currently some of the top performing index funds on the planet. We are also investigating letting users earn revenue by sharing their data and opting into targeted marketing (we are very mindful of user privacy, and don’t currently share data with any 3rd parties). About $500,000 USD has gone into getting Oroeco’s web and mobile apps to their current state, with most funding spent on software design and engineering. Considering Oroeco has saved over 90,000 metric tons of CO2e since launch, this translates into about $5.50 per ton CO2e, which is far below the social cost of carbon. With UI/UX improvements in Oroeco from a 3.0 version we also expect that we can substantially reduce the cost of GHG reductions from behavior change, eventually making GHG reductions profitable for both Oroeco and our users (who are already saving money from most of their actions). Our goal is for Oroeco to become a truly mainstream platform that rewards billions of users for aligning everyday actions with personal values. To do this, we have a laundry list of additional features and design improvements we want to add to make Oroeco more engaging and drive faster organic user adoptions, and we are exploring channel partnerships that can help us grow through their like-minded communities. We hope to get all this into an Oroeco 3.0 version that we estimate will take $1.5 to $2.5 million USD to build into a mainstream global social game and network. Oroeco’s founder, Ian Monroe, teaches courses on climate solutions at Stanford University (stanford.edu/~imon) and Ian recently lost his home to climate-fueled wildfire in California, so he’d also like to include more georeferenced climate actions and personal stories related to current and near-term climate impacts that are closely connected with each user.